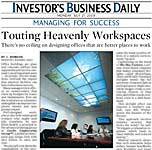 SkyV is a ceiling mounted system of HD LCD screens integrated into a patent pending, faux skylight framework. The system includes multi-channel graphic processors and specialized synchronization software for display of its terabytes of proprietary HD content. SkyV simulates a real skylight, presenting hours of visual content captured from beneath skies and trees worldwide. SkyV displays the formation and dissolution of cloud patterns. It also displays the activity of overhead wildlife and the changing seasons to bring the experience of sky to a wide range of otherwise enclosed interior spaces. Three 47" commercial grade LCD screens with eight hours of segments (approximately one hour each) are licensed with the system and included in the initial price. With a choice of 30 segments, more can be purchased for an additional cost. SkyV is available in a variety of colors, and the surfaces can be customized to match interior elements. Finish options include anodized, mill, or powder coated. Total power consumption is 1420 watts at 110 to 240 volts (a separate circuit is advisable).